Grooming your dog on a regular basis is important as it keeps his coat and skin healthy at all times. However, with so many types of grooming tools out there, picking the right dog brush can be a bit confusing at times. Fortunately, we’re here to help you choose the best dog brush for your furry friend. With the right brush, along with a handful of tools such as dog shampoos and nail clippers, maintaining your dog’s hygiene wouldn’t be that hard. In this article, we’re going to talk about the best dog brushes on the market. We’ll also guide you through the buying process so you can have an idea which brush you should purchase. You might not have thought about this, but brushing your dog’s coat can actually help you perform a check on his skin and fur. You can check for any signs of fleas or ticks, especially if you’re dog spends most of his time outdoors. With regular brushing, you can prevent fleas and ticks from spreading and spare your dog from irritations and bites. Also, brushing your dog’s coat regularly allows you to check for any cuts or injuries that are deeply hidden. If your dog isn’t used to brushing yet, then he may wriggle around while trying to avoid it. However, once he gets used to it, he’ll soon realize that brushing is a pleasant bonding experience and will even look forward to the following sessions. Aside from that, it can be calming for both of you. Matted fur can easily draw in dirt and pests. Once your dog has plenty of mats, brushing his fur can be really painful. In most cases, you will need to cut off your dog’s matted fur. Fortunately, you can prevent that from happening through regular brushing. Brushing your dog’s fur regularly helps prevent matting. Aside from that, it also removes any small matted area before they get even bigger. Lastly, regular brushing can maintain your dog’s good-looking appearance. Aside from that, it also helps him look happier and healthier than a dog who’s not regularly brushed. Before you even decide on a brush, you should first determine your dog’s coat type. Dogs with a short coat will often require a simple bristle brush. However, dogs with longer hair and thicker coat would demand brushes with additional features. Another important factor you have to consider is the size of the brush you should get. You don’t want to use a small brush on a large dog, or vice-versa. Fortunately, most dog brush brands on the market offer small and large brush sizes, so choosing the right-sized product for your dog shouldn’t be that hard. 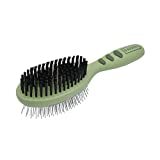 Bristle brush – a bristle brush comes with closely packed bristles which are used on dogs with short coats. It’s a very simple yet functional brush which is ideal for removing any loose hair on your dog. 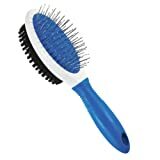 Slicker brush – this type of brush comes with fine wire bristles which are either angled or have protective nubs to avoid damaging your dog’s skin. A slicker brush is perfect for removing mats and tangles as well as brushing your dog’s undercoat. You can also use it if your dog has short hair; however, you have to make sure you don’t scratch your dog’s skin. Shedding blade – despite the name, this is actually a comb with small, harmless teeth. It’s specifically designed for removing loose fur on dogs with short or combination coats. Undercoat rake – this one resembles a pin brush except that it comes with longer and fewer pins. It’s designed for double and heavy coats and can effectively remove any loose fur on your dog with ease. Rubber brush – likewise known as rubber curry brush, this type of brush is applicable for use on all types of coats. Its rubber nubs are ideal for use on short-haired dogs. However, it’s mainly designed for massage and skin simulation. Therefore, you’ll have to use an extra type of brush to do the job. Wire pin brush – featuring rubber tips and widely spaced wire pins, this type of brush resembles a human’s brush. It’s ideal for dogs with a wooly fur but isn’t really effective for those with a short coat. However, it’s not really effective on its own. You’re better off using this after a grooming session instead. Flea comb – this one is made to deal with any fleas and eggs that are present in your dog’s coat and skin. Its teeth are designed to be close together so they can easily pull out any debris and fleas that got stuck on your dog’s fur. 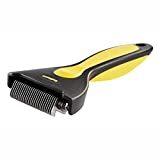 De-shedding tool – a de-shedding tool is specifically designed to remove a lot of loose hair from your dog in a single session. Basically, it removes any dead undercoat hair even before they start falling off your house. If you notice a lot of furry hairs scattered across the floor, then this could be the ideal tool to use. 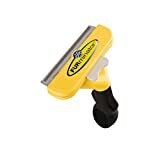 A really popular tool for dealing with a dog’s hair, this de-shedding tool from FURminator is designed to reduce shedding on your dog! It comes with a stainless steel edge that can remove any dead and loose hairs in your dog’s topcoat and undercoat. It’s also effective in removing any tangles and mats. It comes with an ergonomic handle to provide you better comfort and control while brushing your dog. Also, it has button releases that can release any hair with ease. 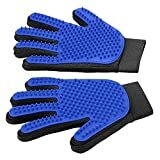 This one differs from the others on the list in that it’s basically a glove which can be considered an alternative to the traditional dog brushes. It’s the perfect option if you think your dog can’t get used to a grooming session. That said, it’s simple but really effective in removing any loose and dead hair from your dog without having to spend hours brushing him. It can easily slip over your hand and can be adjusted easily with the help of an adjustable wrist strap. Moreover, it will easily glide through the topcoat of your dog, removing any dead and loose hair while keeping him comfortable in the process. 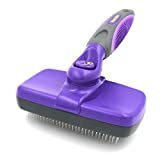 This slicker brush from Hertzko is intended for removing tangles and mats from your dog’s coat. However, it’s also ideal for daily brushing application on dogs with delicate coats. That aside, it has a sturdy construction along with an ergonomic handle and a wide head to provide wider coverage. For easy cleaning, the brush comes equipped with a button which causes the bristles to retract back. This allows you to remove all of the hair in the brush with ease. 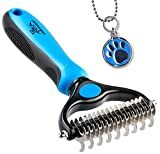 Another quality product from Pat Your Pet, this one is a grooming tool featuring a 2-in-1 dual head with 9 teeth and 17 teeth respectively, designed to deal with tangles and mats and offer your dog with a well-groomed appearance after a brushing session. Despite the teeth being made of metal, they’re absolutely safe for your pet. In fact, the rounded outside teeth will gently massage your pet’s skin to give him that comfortable feeling while brushing, while the inside teeth can cut through tangles and mats with ease. Considered by many to be the best curry brush in the market, the KONG ZoomGroom is ideal for removing dirt and debris from your dog’s fur. 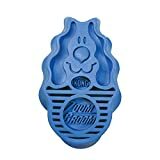 It features soft rubber teeth which can easily penetrate your dog’s top coat and provide him with a gentle, massaging action. Additionally, it’s made of heavy-duty rubber, so you can expect it to last for a long time. If you’re looking for a grooming tool in a fun and sleek design, then this one is definitely an excellent choice. Oster’s Shedmonster is no doubt one of the best options when it comes to shedding. It features two different brushes designed for the type of coat your dog has. Aside from that, the manufacturer claims it can reduce shedding on your dog by up to 90%! Meanwhile, its stainless steel teeth can penetrate your dog’s undercoat with ease. Although they look a bit intimidating, they’re actually smooth and have rounded edges to offer your dog with a comfortable, massaging action. If you need a pin and bristle brush combined into one, then this is definitely for you. It’s a 2-in-1 brush which is ideal for use on dogs with smooth and medium hair. The bristle brush will deal with dead fur, while the pin brush is perfect for pups with a medium fur. That said, it’s an excellent option if you have dogs that have short and medium hair. It’s also available in medium and large sizes, so you can easily pick the right one for your pet. 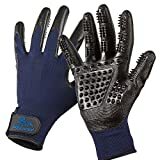 Just like the grooming glove from Pat Your Pet, this one from Delomo comes with an enhanced 5 finger design which makes cleaning your pet, especially in his hard-to-reach areas, a lot quicker and easier. Aside from that, its rubber tips provide your dog with a calming and relaxing feeling. Compared to Pat Your Pet’s, this one actually comes in a pair so that you can use both hands for grooming your dog. It’s capable of removing any dirt, dead hair, and tangles with ease. The only bath brush on this list, the Bodhi brush is an excellent product that can keep your dog’s coat and skin shiny, healthy, and free of any dirt and debris. As it comes with rubber tips, you can expect your dog to remain comfortable while brushing. Also, it has an easy-to-use handle which makes brushing your dog a lot easier. Since it’s not designed to remove dead fur, you can use it on your dog regardless of his fur and skin type. Available in a 2-in-1 design, the Oster combo brush is the ideal choice for your dog’s daily grooming needs. One side is designed to deal with dead hair, while the other is mainly used for removing any dirt and dander off your dog. Basically, if you’re dog has a medium to long hair, this one could be an excellent option. It’s also perfect if you need a versatile tool to groom your pet. Since it has a fairly huge size, it can work well even for dogs with thick coats. Made for dealing with the toughest of mats and tangles, this mat remover from Hertzko can get the job done with ease while making sure that your dog remains comfortable throughout the session. It comes with sharp teeth to prevent pulling hair while having curved ends to prevent hurting your dog’s skin. Aside from that, it’s designed with an ergonomic and non-slip handle to make grooming sessions smooth and hassle-free. Lastly, it offers a massaging sensation, leaving your pet’s coat shiny and healthy. 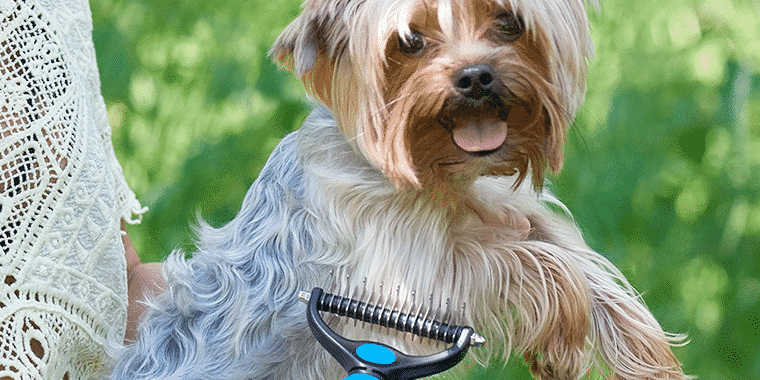 When buying a dog brush, one thing you have to keep in mind is that most dog owners usually use more than just one type of brushing for grooming their dog. This is because there are certain types of coats that demand more than just a single brush type. If that’s the case, then going for two or more of the best dog brushes certainly won’t hurt. Also, keep in mind that when grooming your dog, some hairs would scatter on the floor. If left unattended, they might be a bit harder to clean. In such a case, using a vacuum for dog hair would certainly help.